Another venue that sits between Northampton and Daventry but which is very much worth checking out. The Granary sits literally just down the road from the majestic Fawsley Hall but what it offers could not be a greater contrast. 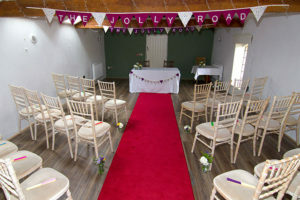 Whereas Fawsley Hall offers the ultimate formal location with a huge stately home backdrop, The Granary provides a secluded and self contained wedding world sitting in beautiful, quiet countryside. You really do feel like nothing else is happening in the world except your wedding and that makes it very special. 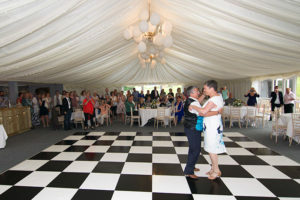 The lovely lawned area is great for post service drinks and the huge evening marquee style reception room has one of the biggest and best dance floors I have ever seen. 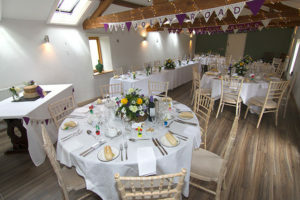 All of this delivered by an enthusiastic and very attentive wedding team ….. a cracking venue ! Photography – so long as the weather allows you outside, The Granary has everything you could want for photography.